The Pentax K-50 Digital SLR is a great all-around camera with a weather-resistant, cold-proof and dustproof construction, offering an impressive level of specification so that you can enjoy high-quality photography with minimal effort and in any environment. The K-50 DSLR features a 16.0MP CMOS sensor, high-speed continuous shooting at approx. 6 fps, high-sensitivity at ISO 51,200 and accurate AF and precise tracking of moving subjects. The tough exterior of the K-50 provides a solid performance under demanding outdoor conditions, and will ensure minimum maintenance in years to come. The Pentax K-50 includes a wide range of advanced shooting features, such as full HD movie recording and a selection of creative tools such as digital filters, to accommodate various shooting requirements. 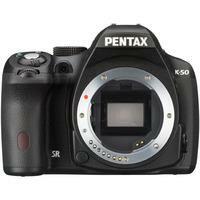 Pentax K-50, white, with 18-55mm DAL WR lens, only 1400 activations!